WE ARE NOT SELLING A BED, WE ARE SELLING A LIFESTYLE. 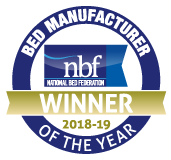 A MILLBROOK BED IS AN ASPIRATIONAL PRODUCT AND A LIFESTYLE CHOICE. Millbrook Beds is dedicated to the traditional British ideals of quality and craftsmanship. From the hand-nesting of our individual pocketed springs, to our natural upholstery of sumptuous pashmina, soft silk and pure new lambs wool – every stage in the making of our beds must meet our exacting standards of timeless quality. All of Millbrook Beds divans are constructed using timber from FSC®-certified forests. ‘The Forest Stewardship Council (FSC) is an international, non-governmental organisation dedicated to promoting responsible management of the world‘s forests. It was founded in 1993 in response to public concern about deforestation and demand for a trustworthy wood-labelling scheme. FSC has developed a system of forest certification and product labelling that allows consumers to identify wood and wood-based products from well-managed forests. Demand for forest products, such as timber and paper, continues to grow, putting increasing pressure on the world‘s forests. Wood is a renewable resource; when forests are well managed, with consideration for the environment, the wildlife and the people who live and work in them, harvesting timber can actually be an effective way of safeguarding the forests for future generations. The pocket spring is at the heart of all our top quality sprung beds, each spring is placed into its own individual pocket and sewn all around to isolate it from its neighbours, ensuring no ‘roll-together’. Double stacking and individually hand nested pocket springs provide superior levels of support. The top tier if the springs absorbs the majority of the weight whilst conforming to the body shape. The bottom rows resist more gently adding to the overall support and also to the longevity of the mattress, all working in harmony to ensure that your body is supported. Our unique Zonal edge springing provides extra strength to the sides of the mattress, by applying 2 rows of firmer springs on either side, ensuring no ‘roll-off’ or sleep disturbance. Every mattress in the range features traditional hand-side stitching which secures the outer springs to the border at top and bottom preventing ‘roll-out’, and is the most highly skilled and labour intensive of all our operations. Side-stitching is carried out by senior upholsterers using traditional long needles and twine to make borders and edges stronger. The effects on the mattress are quite dramatic preventing the springs from distorting and extending the sleeping area right up to the edge of the bed. The fully pocket sprung firm edge divan base provides a supportive foundation for the mattress. All divans are made from solid timber to carry the weight of the sumptuous mattress and load-bearing joints are secured and glued by hand for lasting strength. All divans are mounted on hidden smooth running solid metal casters. The drawers come complete with unique, smooth ball-bearing steel action runners.